Rjukan, Norway, 2017. The town of Rjukan, 3400 inhabitants, was founded between 1905 and 1916 and is located in a narrow valley 3 hours north-west from Oslo. During the winter months, from September to March, the village is completely in the shade, as the sun, covered by the 1800 meters high peak Gaustatoppen, can't illuminate it. 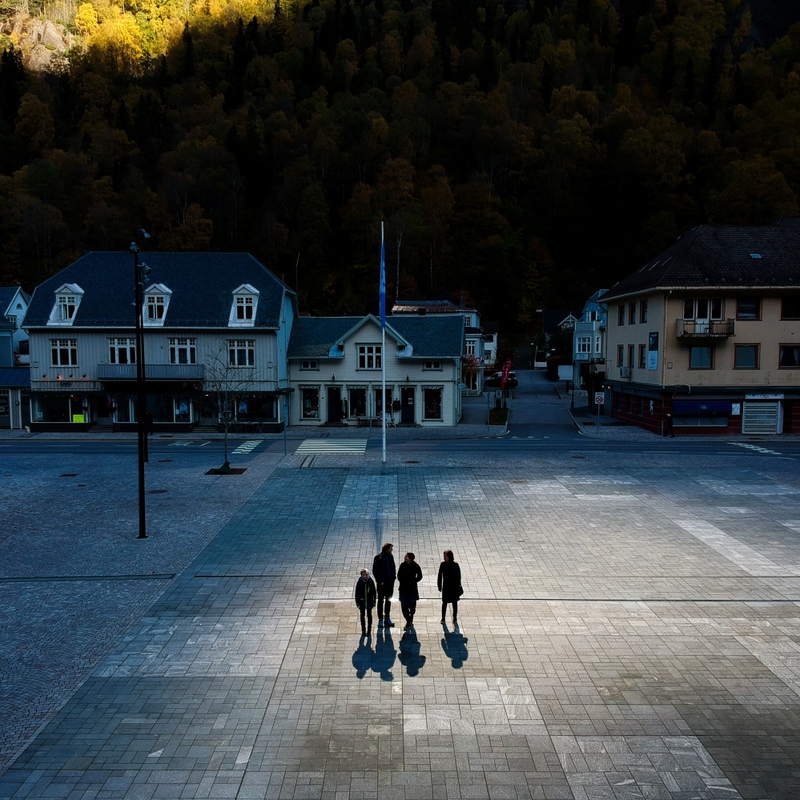 In 2013, a local artist named Martin Andersen, submitted to the community the intention to put on the top of the mountain three huge solar-powered mirrors able to reflect the sun light on the town square. 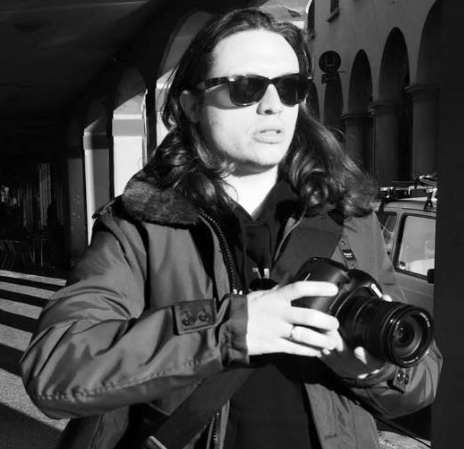 Rjukan, Norway, 2015. 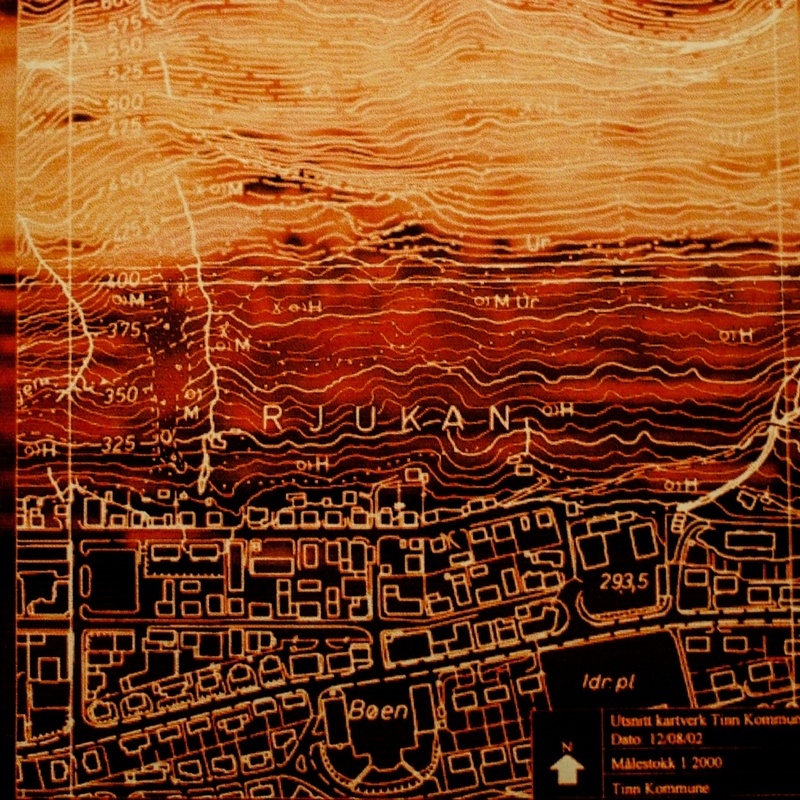 A sunmap of Rjukan, illustrating from lightest to darkest color, where the sun enlights the city during winter. Rjukan, Norway, 2017. 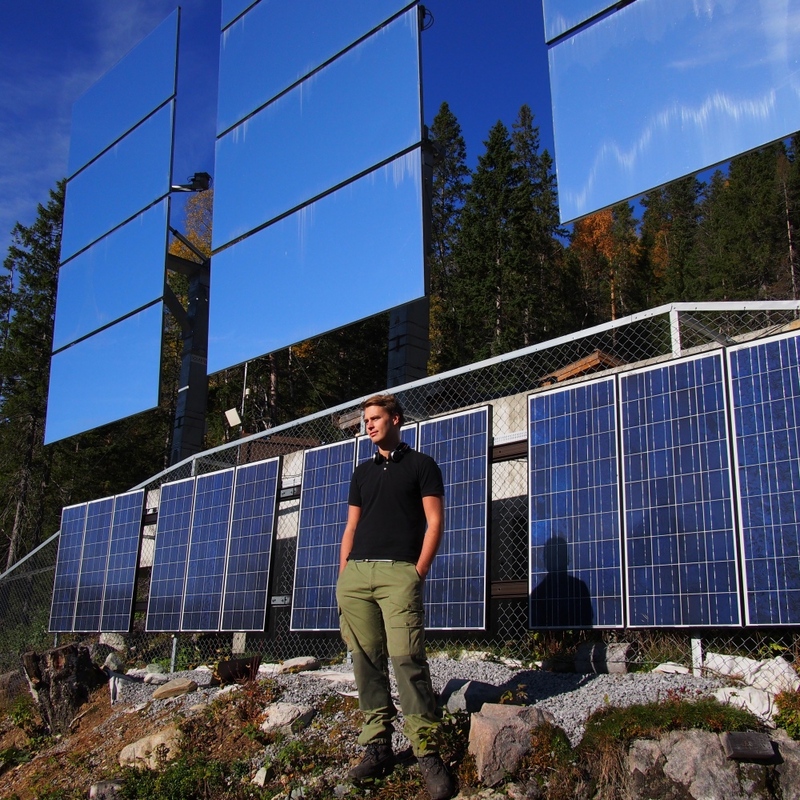 Martin Andersen, 40, brushing up on an idea of the founder Sam Eyde, considered unworkable at the time due to a lack of technology, submits to the community the intention to put on the top of the mountain three huge solar-powered mirrors, able to reflect the sun light on the town square. The project, called SOLISPEIL, became true in 2013, for the price of 5 millions Crowns. 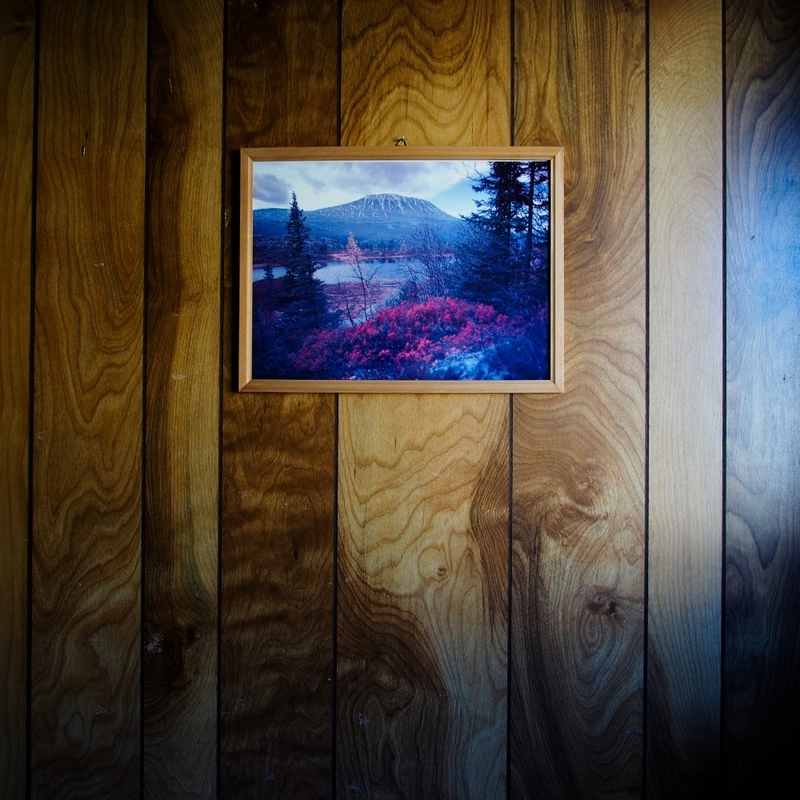 Rjukan, Norway, 2015. A detail of a house in the village. Rjukan, Norway, 2017. A family is looking toward the light reflected by mirrors, covering their faces to protect their eyes. Rjukan, Norway, 2015. A painting illustrating the Gaustatoppen, the mountain responsible for sun absence in the village. Rjukan, Norway, 2017. 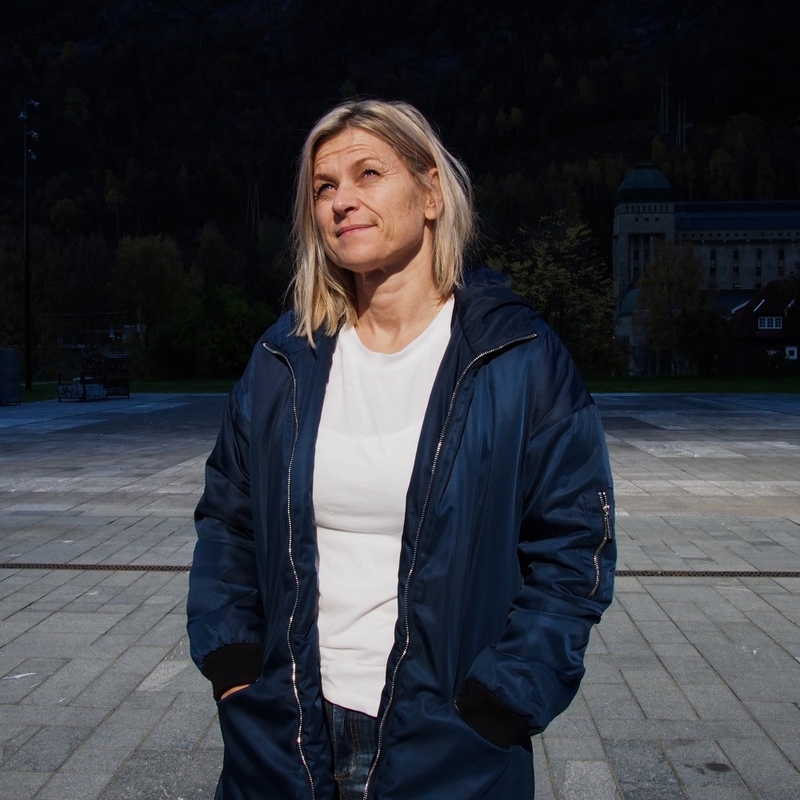 Lena Benita Dokka, wife of Martin Andersen, born and raised in Rjukan.She owns a second-hand shop near the town square. Rjukan, Norway, 2017. 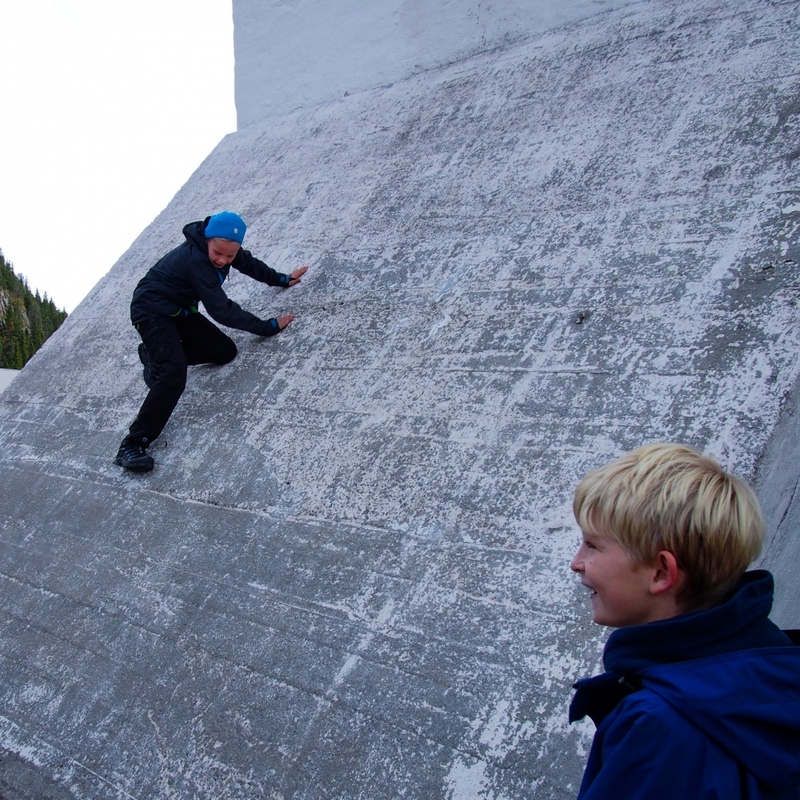 Rjukan is located three hours North-West from Oslo, in a narrow valley reached by buses. Rjukan, Norway, 2017. Eric Brithen, 23 years old, posing in front of the mirrors, located 450 meters above the town. He is in charge to take care of the maintenance of the mirrors, and that's why he is called the "Warden of the sun". He climbs the mountain three times per year, to check if everything works well. The mirrors are able to reflect a 2000 square feet circle of light on the main square, each mirror follows the sun movement during the day, to maximize the effect. Rjukan, Norway, 2017. The effect of the sun mirrors in the main square. Rjukan, Norway, 2017. 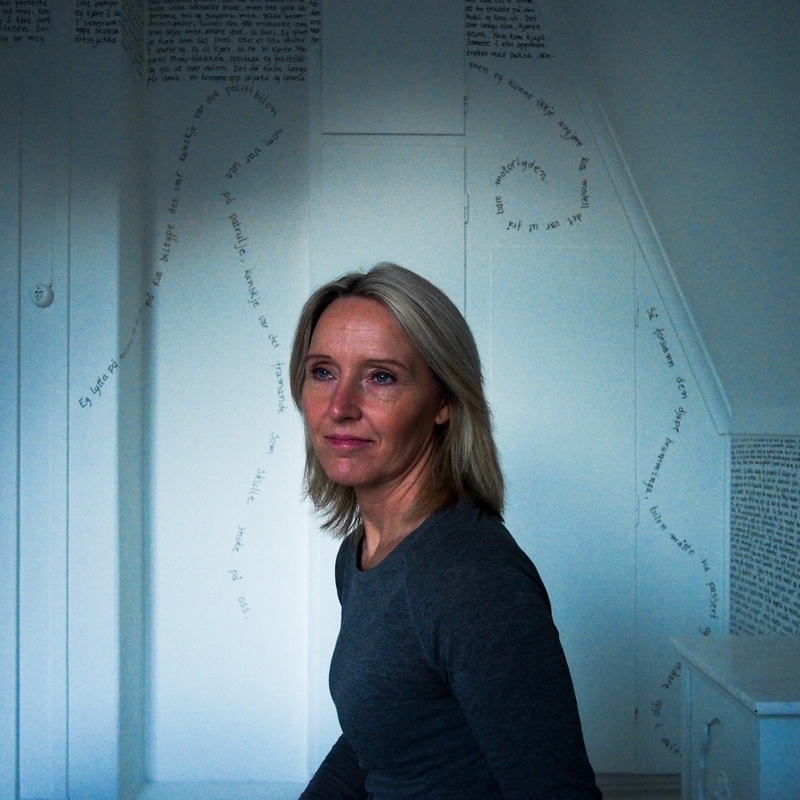 A portrait of Liv Solberg, 49, a retired nurse, she is a painter and she owns an art gallery in Rjukan. Rjukan, Norway, 2017. 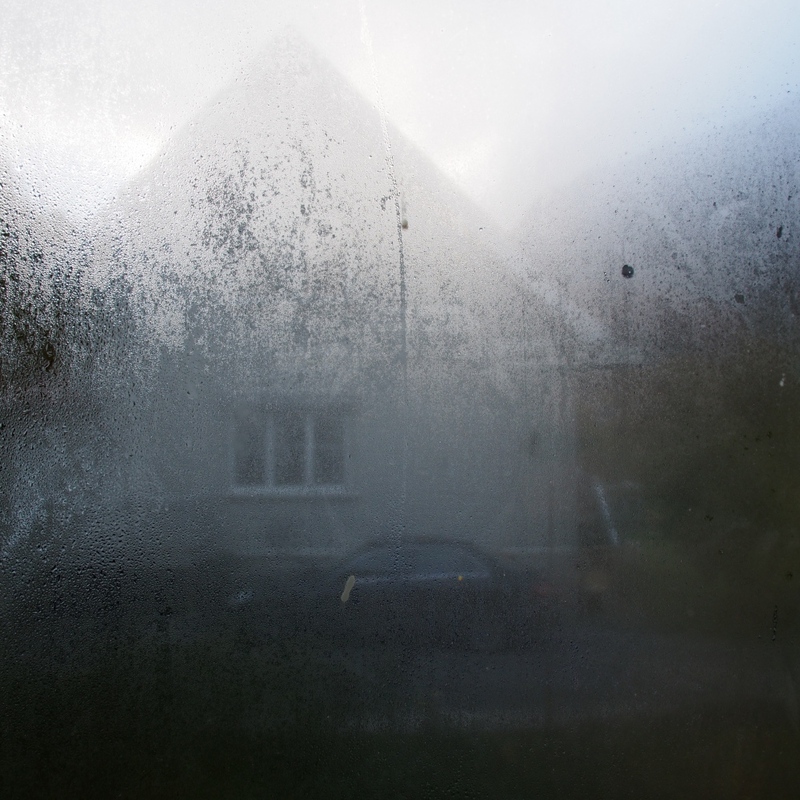 A detail of a house in the village, during the cold month of October. Rjukan, Norway, 2015. On the right side, down the mountain, is located the Norsk Hydro power plant called "The Opera", that produces hydroelectric power. Rjukan, Norway, 2017. 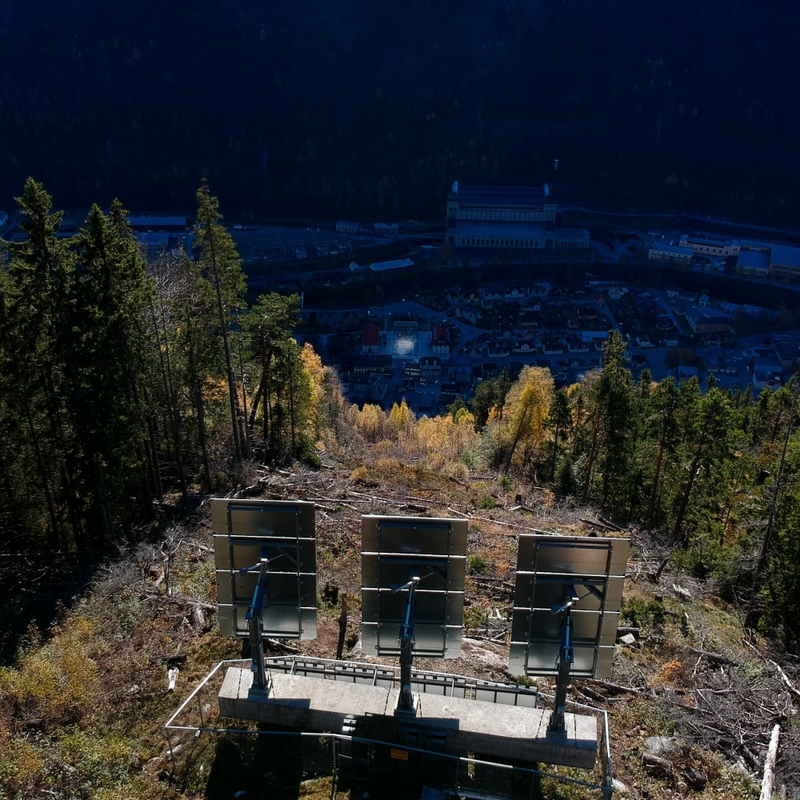 Due to direct sunlight absence, Sam Eyde, the founder of Rjukan, decided to build a cable car named Krossobanen, that carried workers and miners on the top of the mountain, letting them receive the winter sunlight. Today the Krossobanen is used by tourists to reach the trekking paths. 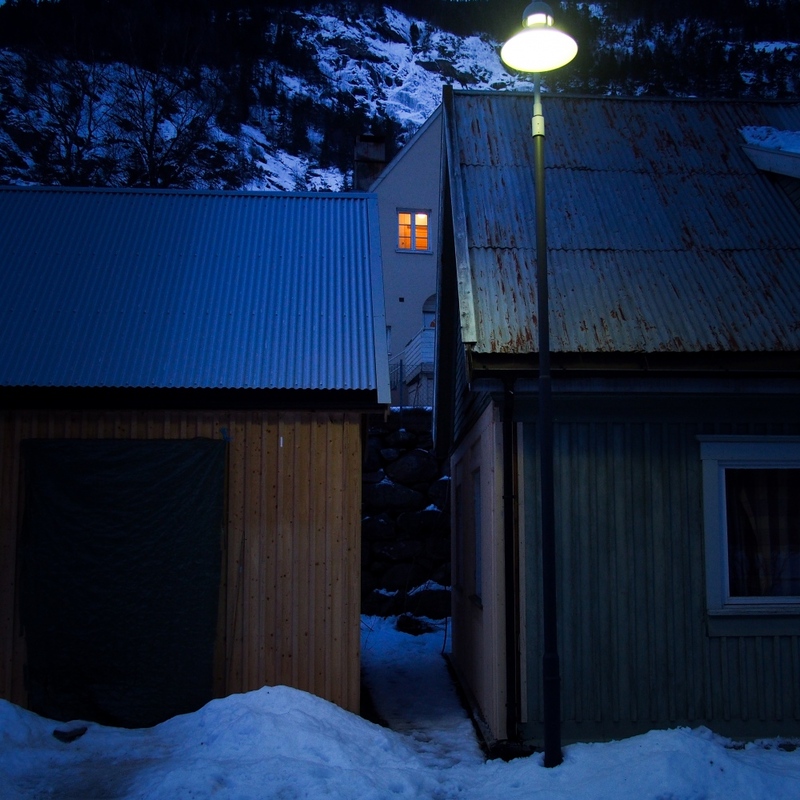 Rjukan, Norway, 2015. 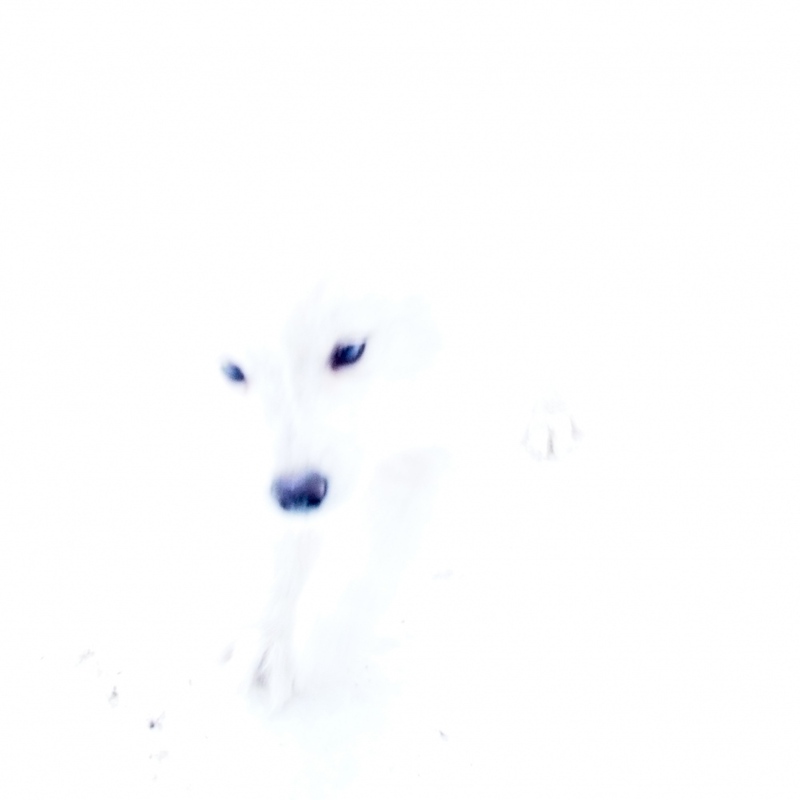 A white dog plays on the snow. 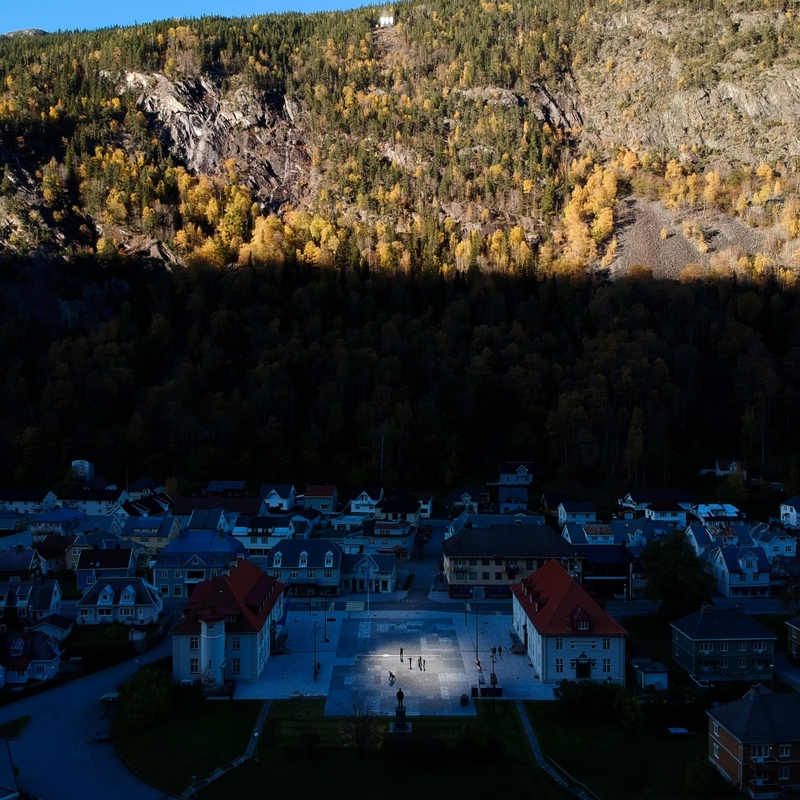 Rjukan, Norway, 2015.As the village isn't reached by the sun during winter, temperatures are particulary low. 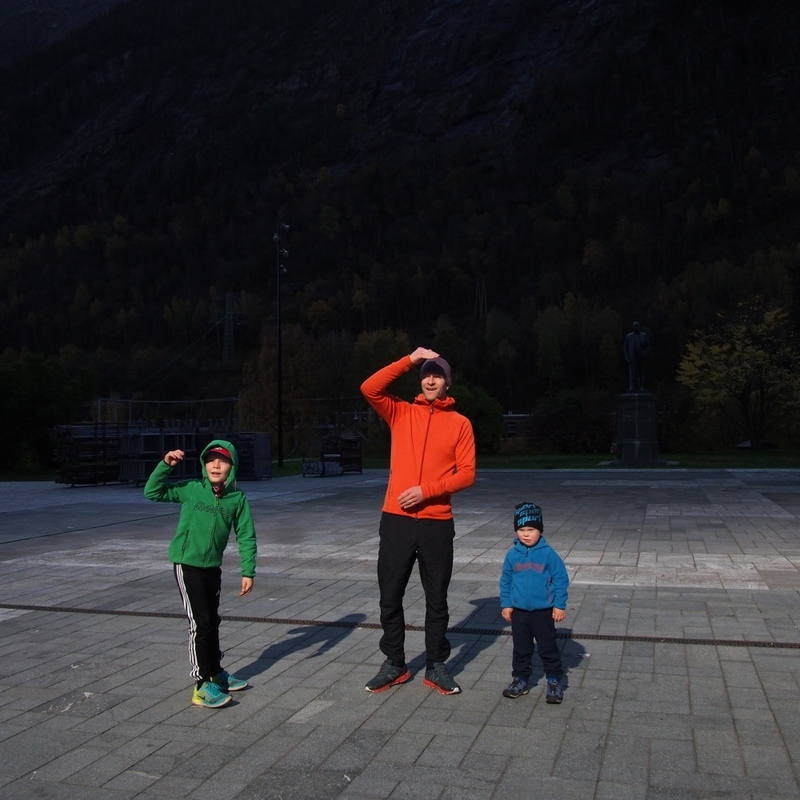 Rjukan, Norway, 2015. 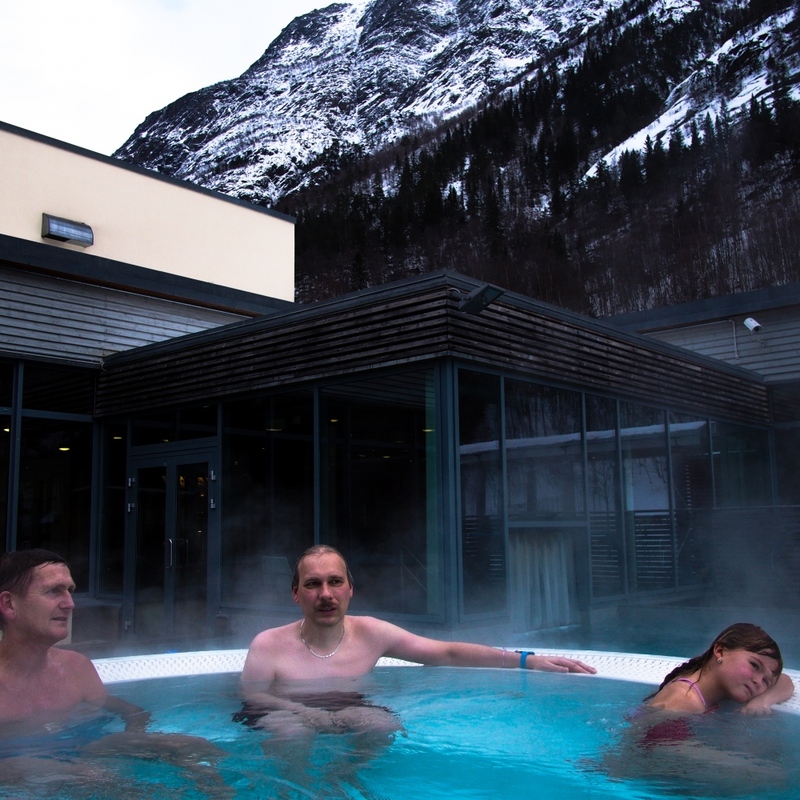 The thermal pool Rjukan Badet, situated in the centre of the village, where local people go to relax and meet each other. Rjukan, Norway, 2017. Children playing near the cable car station, on the top of the valley, because during winter is one of the closest places with sunlight. 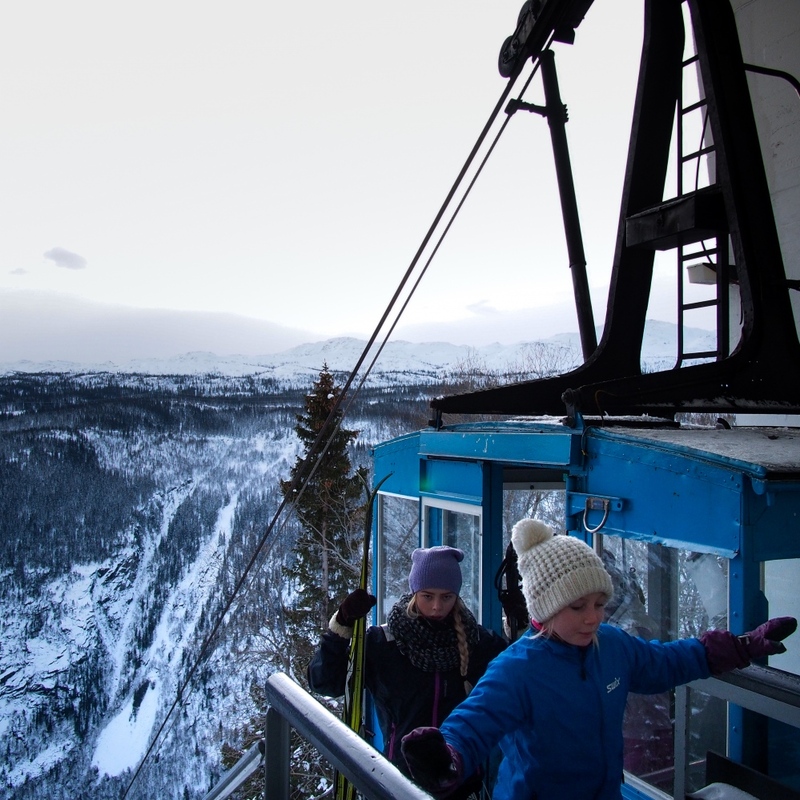 The cable car was built by the founder of Rjukan, Sam Eyde, during the first decades of the last Century, to bypass the problem of direct sunlight absence, which also caused depressive disorders and vitamin D deficiency. Rjukan, Norway, 2017. 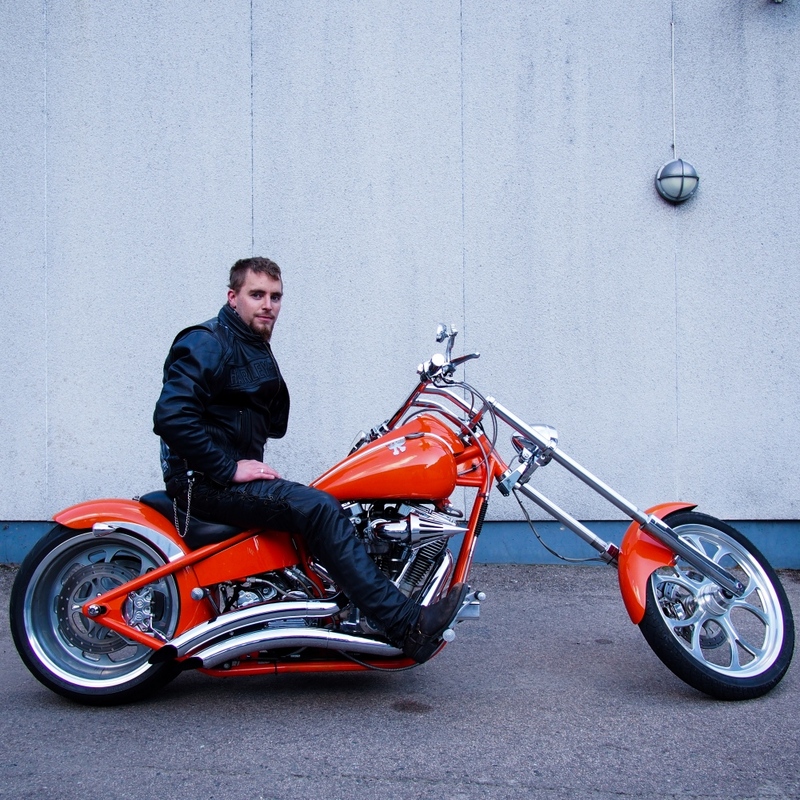 Eric, a biker living in Rjukan. 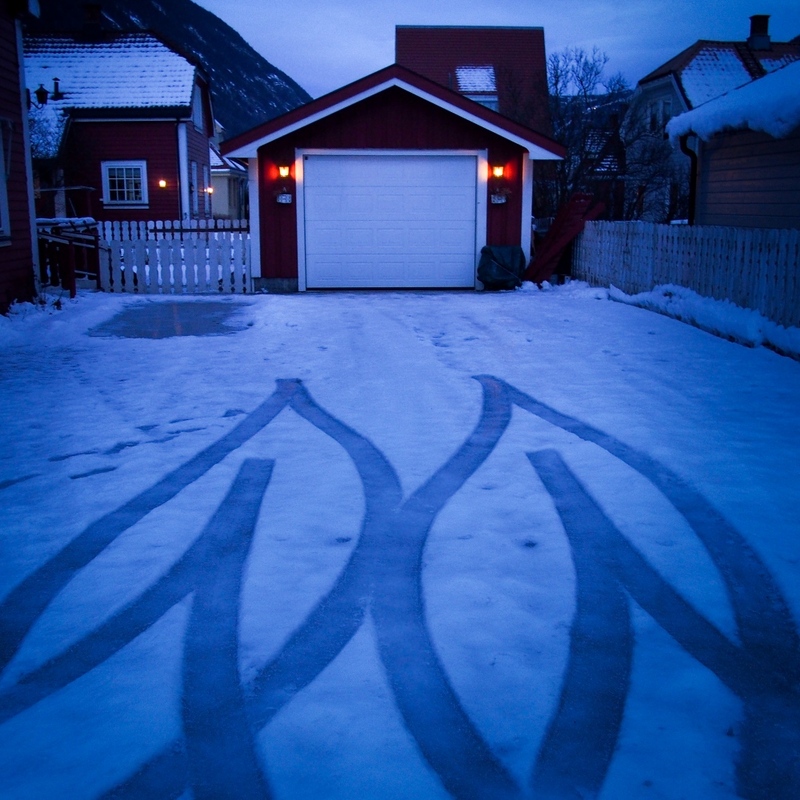 Rjukan, Norway, 2015. 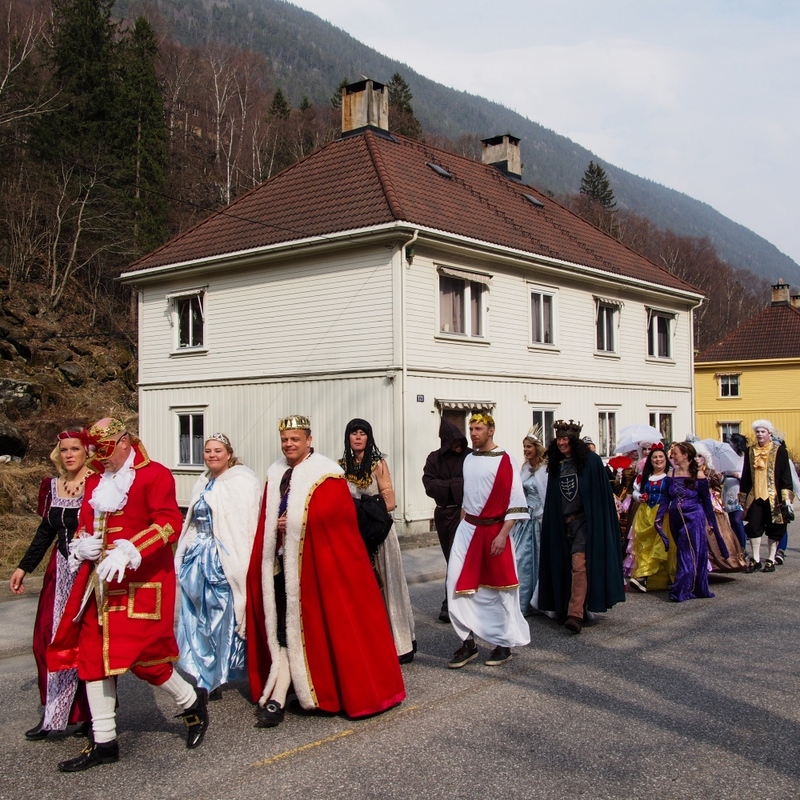 In April, Rjukan celebrate the Solfest, the return of sun from behind the mountain, with a costume parade. During the parade, the Lord of Sun is elected by the community, he remains in office for one year and keeps the title for life. 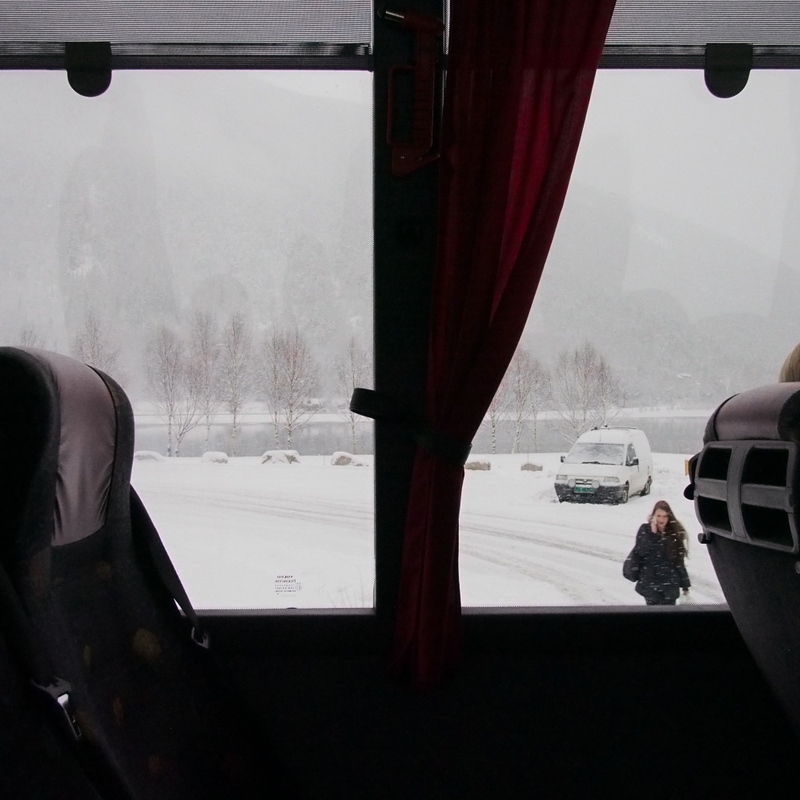 Rjukan, Norway, 2015. 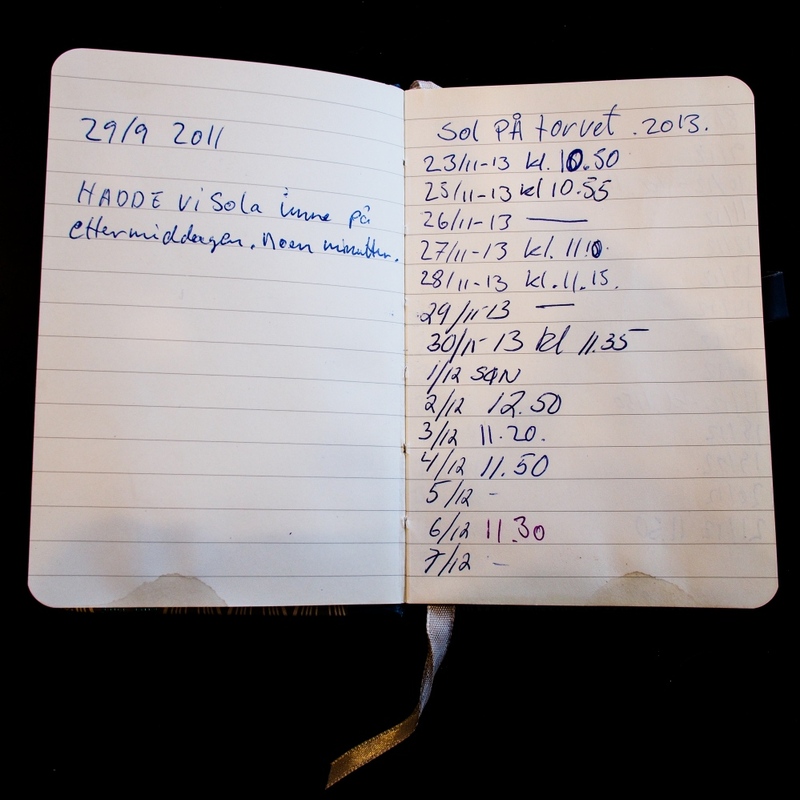 Some inhabitants decided to mark on a small notebook the days in which the sun reaches the village during winter. Rjukan, Norway, 2015. 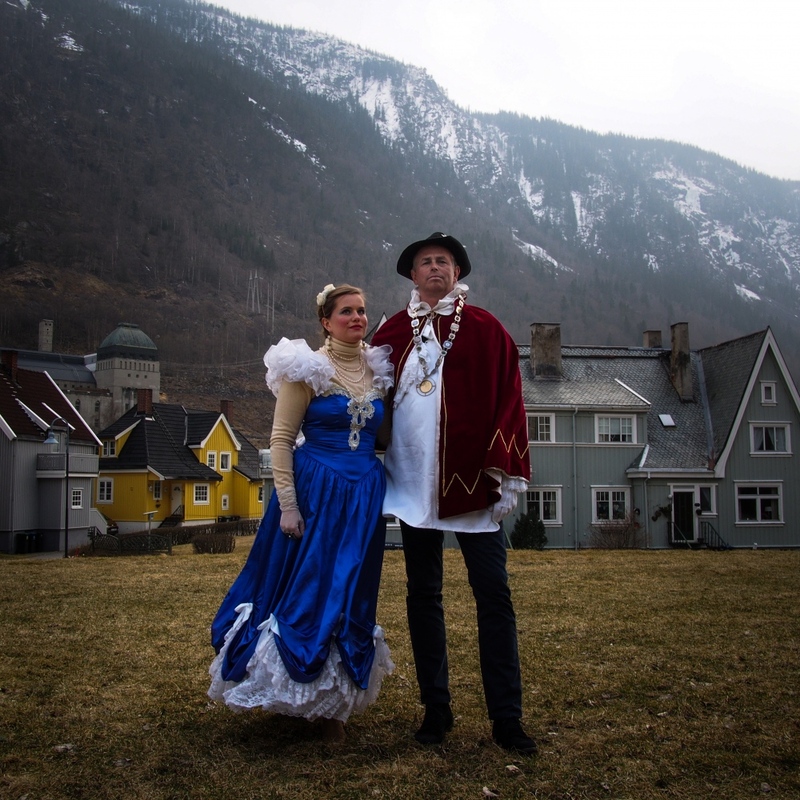 In April, Rjukan celebrate the Solfest, the return of sun from behind the mountain, with a costume parade. Rjukan, Norway, 2017. 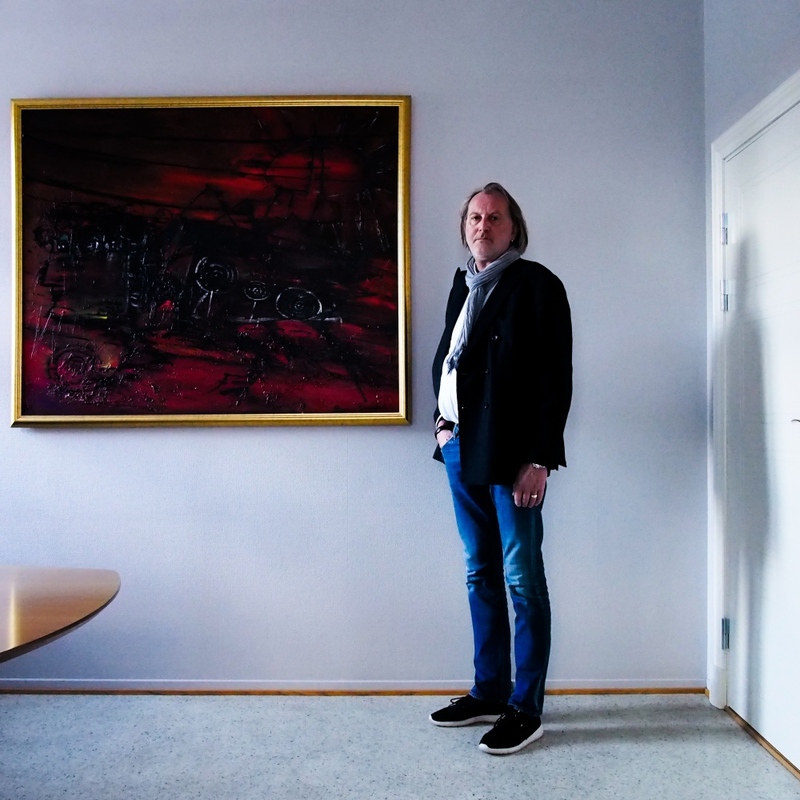 Bjōrn Sverre Sæberg Birkeland, the major of Rjukan. Rjukan, Norway, 2017. 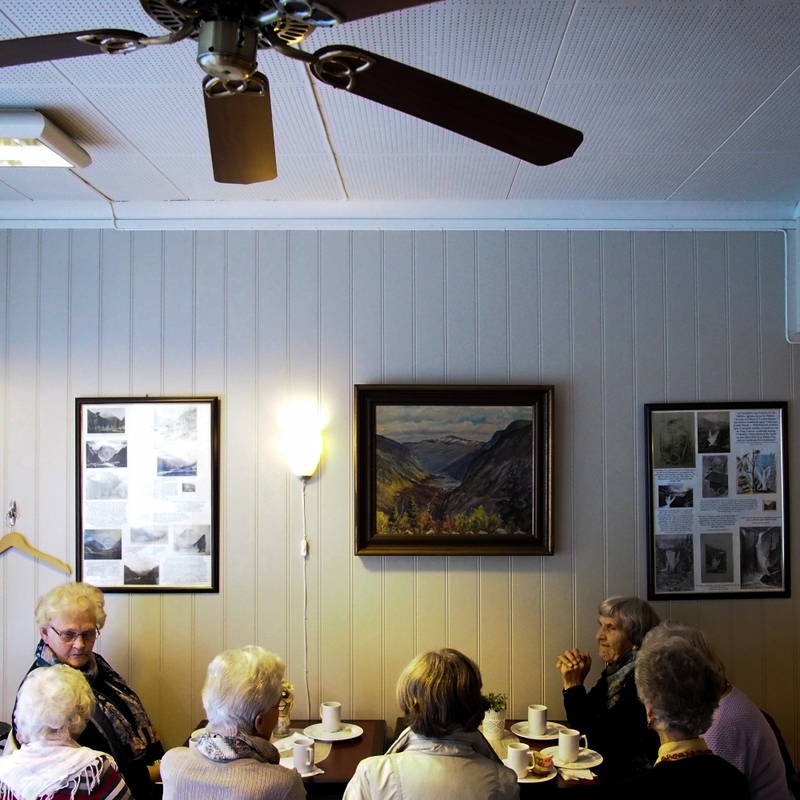 A daily life scene inside a cafè in Rjukan. Rjukan, Norway, 2017. 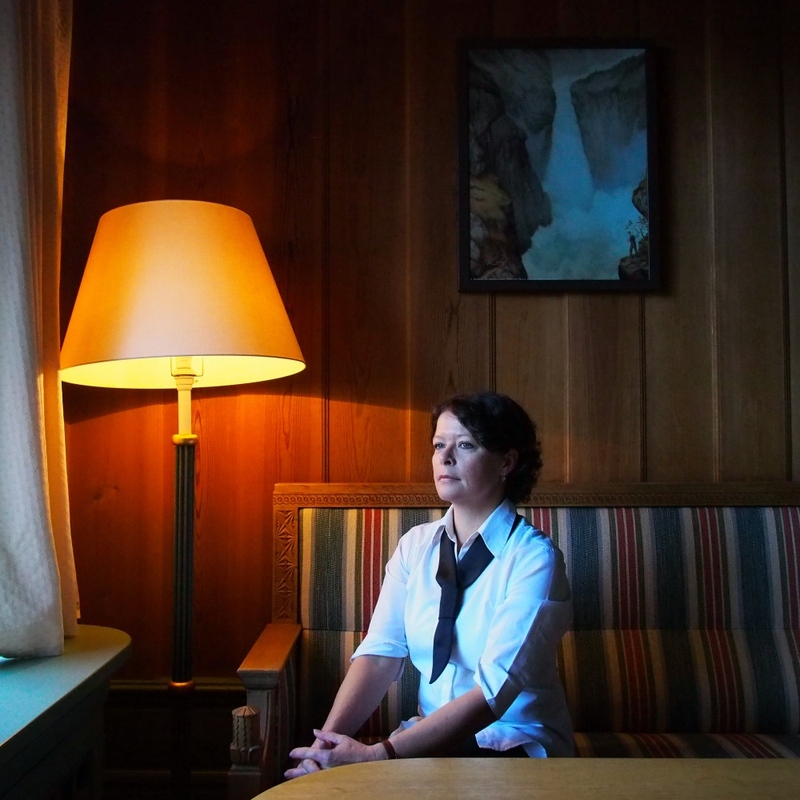 A woman, living in Rjukan, is looking at the sunlight reflected by mirrors. Rjukan, Norway, 2017. The mirrors are located 450 meters above the town, and they reflect a 2000 square-feet circle of light. A solar-powered engine installed behind each mirror follows the sun movements during the day to maximise the effect. Located in a narrow valley three hours north-west from Oslo, Rjukan counts 3400 inhabi- tants, who during the cold winter months from September to March, live completely in the shade, as the sun, covered by a 1800 meters high peak, called Gaustatoppen, can’t illu- minate the village. For this reason Martin Andersen, a 40 year old artist, brushing up on an idea of the founder Sam Eyde, considered unworkable at the time due to a lack of technology, sub- mits to the community the intention to put on the top of the mountain three huge solar- powered mirrors, able to reflect the sun light on the town square. The project, called SOLISPEIL, became true in 2013, for the price of 5 millions Crowns. 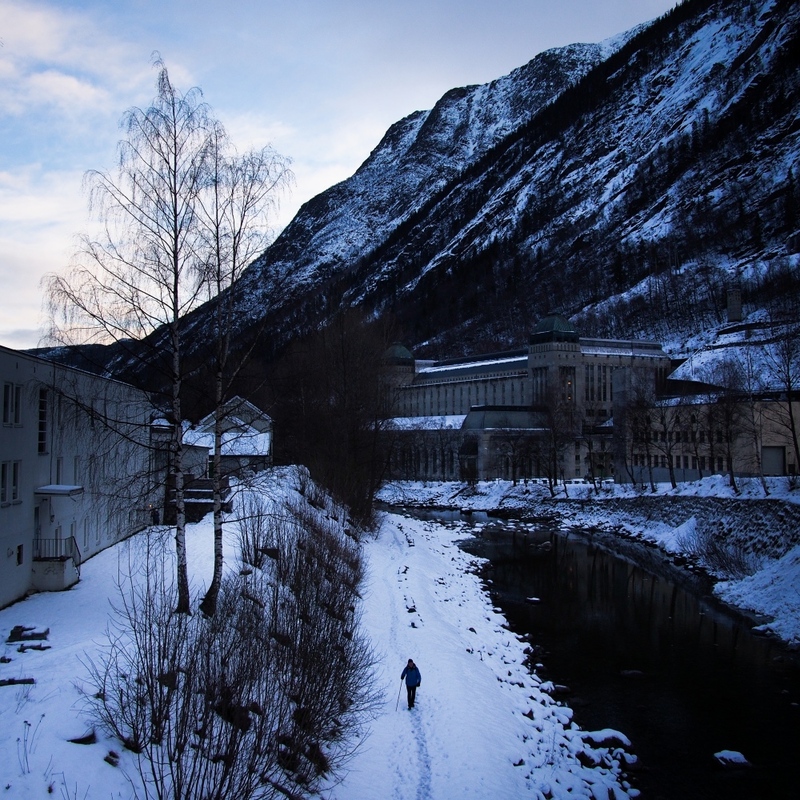 The town of Rjukan was founded by Sam Eyde between 1905 and 1916, when the com- pany Norsk Hydro decided to start the production of Saltpetre. The mirrors are located 450 meters above the town, and they reflect a 2000 square-feet circle of light. A solar-powered engine installed behind each mirror follows the sun move- ments during the day to maximize the effect. Sam Eyde, during the first decade of the last Century, unable to realize something similar, decided to bypass the problem of direct sunlight absence, which also caused depressive disorders and vitamin D deficiency, building a cable car that carried workers and miners on the top of the mountain, so that they could receive the winter sunlight. Some inhabitants decided to mark on a small notebook the days in which sun reaches the village during winter. In April, Rjukan celebrate the SOLFEST, the return of sun from behind the mountain, with a costume parade. Often, these dresses are related to the sun or to its absence. During the parade, the Lord of Sun is elected by the community, he remains in office for one year and keeps the title for life. The Sunborn Child is also elected, a child born near the day in which sun crosses for the first time the mountain edge and shines again on the town. By Federico Borella — Senza titolo 2 In Japanese, “Ama” means “women of the sea”, and this name is referred to Japanese pearls divers who strike the magination..
By Federico Borella — Warabistan “WARABISTAN” - The Kurdish limbo in Japan - In a country like Japan, with increasing demographic crisis and shortage of workforce..
By Federico Borella — Indian Summer: Amusement Park Industry The amusement park industry in India is more than two decades old and is still at nascent stage. The first..
By Federico Borella — Aiko: diving to preserve the traditions Toba province, Mie prefecture, Japan, Sept. 2016. Aiko Ohno, 37, is one of the youngest professional Ama..
By Federico Borella — LIVING WITH THE ATTACKER Geeta and her daughter Neetu are still living with the man who, 25 years ago, disfigured them with the acid. 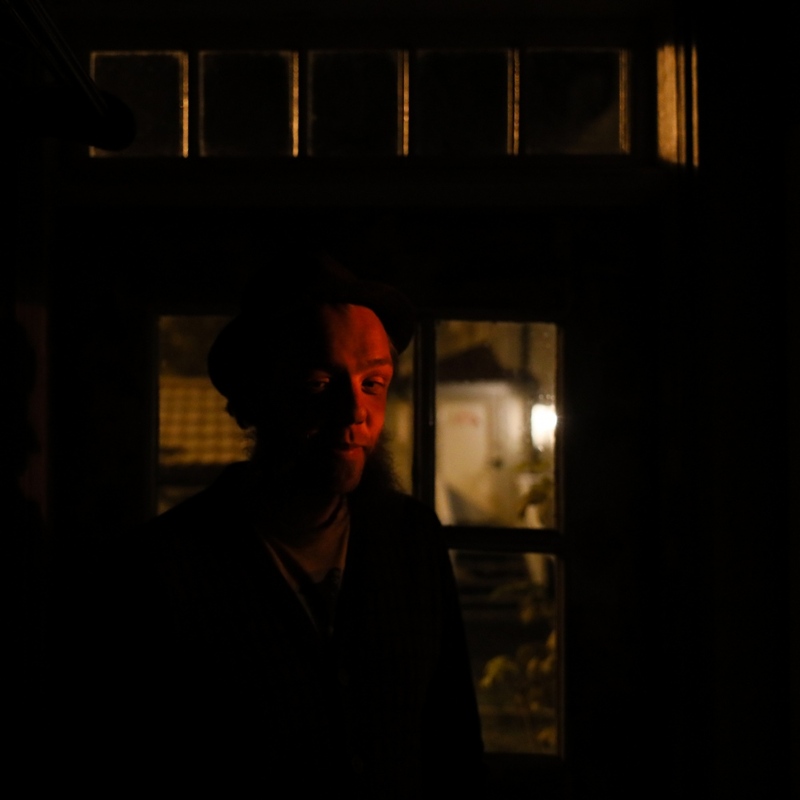 ..
By Federico Borella — March 26 th 2010. Cpl. Todd Nicely, 26, was leading a patrol in Lakari, Helmand province, south Afghanistan, with 12 Marines of the 1 st Squad, 1..
By Federico Borella — Crystal Meth is a totally synthetic drug which comes in the form of white crystals. It can be sniffed, smoked in a glass pipe or injected. It is..
By Federico Borella — The Sheroes Hangout Cafe is not a place like any other. It’s unique in the world. Customers are served coffee, of course, but the women who work..